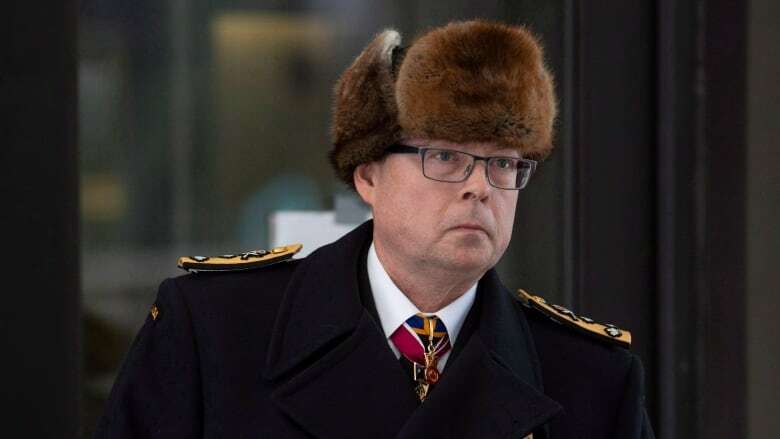 Several major government figures at the centre of the criminal case against Vice-Admiral Mark Norman have not searched their personal email and phones for any correspondence relevant to the case, despite the instructions of court-ordered subpoena. Zita Astravas, who serves as the chief of staff to Defence Minister Harjit Sajjan, was called to testify Thursday at a pretrial hearing in the breach-of-trust case against Norman. She said the advice she received from lawyers at National Defence was that she was required only to surrender communications from her work-provided BlackBerry phone. Norman's defence team, led by Toronto lawyer Marie Henein, has been fighting in court for the disclosure of thousands of federal government documents — and have accused the federal government of conducting a selective and haphazard search for those documents. In testimony Wednesday, Chief of the Defence Staff Gen. Jonathan Vance acknowledged that he had not searched his personal email or his iPhone for anything that might relate to the case. Gen. Vance has insisted he doesn't conduct any work-related business on his non-government devices. Earlier this week, lawyers for federal cabinet minister Scott Brison delivered to court personal emails relevant to the case, separate from his government accounts. Norman, the former commander of the navy, has been charged with one count of breach of trust and is accused of leaking cabinet secrets related to a $668 million contract to lease a supply ship for the navy. He was suspended as the military's second-in-command in January, 2017. Astravas was director of issues management in Prime Minister Justin Trudeau's office between November 2015 and August 2017 — the time period when the criminal investigation involving Norman first became public. She would have been the staffer tasked with briefing the prime minister on important issues and daily crises. Astravas testified she didn't know if her former email account had been searched in response to a subpoena issued by Norman's lawyers. Robert MacKinnon, the federal lawyer responsible for the record search, told the court the instruction given to all departments was that all devices must be searched. He said that instruction will be repeated. ​The pre-trial hearing has focused largely on the collection and production of communications relevant to the case. The actual trial is scheduled to begin in August, just months before the federal election. Henein asked Astravas if she is aware of any communications within government about the timing of the case. "Do you recall having any communications about delaying this trial or about the timing of this trial?" she asked. "I don't remember," Astravas replied. On Tuesday, the defence team produced a list of words used in documentation to refer to Norman that it had obtained through Access to Information. They include Kracken, MN3, C34 and The Boss. Vance said the military routinely uses jargon, acronyms and pseudonyms and he didn't see anything on the list that he thought would qualify as a 'codename'. The list released to the defence team through the access request did not include any terms used in Sajjan's office, which claimed a ministerial exemption from the request. Astravas said after she received a subpoena to appear in court late Wednesday, she asked her staff to make "best efforts" to check if other pseudonyms for Norman had been used. She said they did not come up with additional terms. Henein asked if Astravas knew of the terms "the certain naval officer," "a certain naval fellow" or a "a naval colleague" being used, but Astravas said she could not recall. Norman's defence team has been engaged in legal wrangling with government lawyers over the the release of documents deemed relevant to the case. Henein described the situation as "quite extraordinary," with the government asserting cabinet confidence over certain documents and the defence securing subpoenas to obtain those documents. Crown lawyer Barbara Mercier suggested the defence is trying to prolong the process to "kingdom come." "I have a very strong feeling that this has been a very large fishing expedition," she said. Mercier was subsequently scolded by Justice Heather Perkins-McVey for suggesting the hearing has been pushed off track by the defence. "You don't need to remind me again that my job is to look at what is likely relevant and what is in response to this application," the judge said. "I am doing so. I will be doing so."